The particular exploration of new ways of interactions between society and Information Communication Technologies (ICT) with a focus on the Humanities has the potential to become a key success factor for the values and competitiveness of the Nordic region, having in mind recent EU and regional political discussions in the field of Digital Humanities (European Commission, 2016; Vetenskapsrådet’s Rådet för forskningens infrastrukturer, 2014). 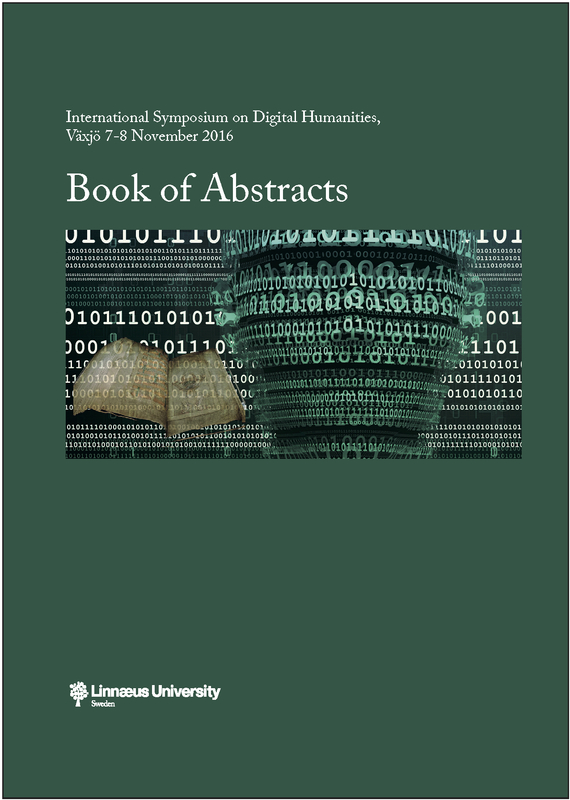 Digital Humanities (DH) is a diverse and still emerging field that lies at the intersection of ICT and Humanities, which is being continually formulated by scholars and practitioners in a range of disciplines (see, for example, Svensson & Goldberg, 2015; Gardiner & Musto, 2015; Schreibman, Siemens, & Unsworth, 2016). The following are examples of current areas of fields and topics: text-analytic techniques, categorization, data mining; Social Network Analysis (SNA) and bibliometrics; metadata and tagging; Geographic Information Systems (GIS); multimedia and interactive games; visualisation; media. DARIAH-EU (http://dariah.eu), is Europe’s largest initiative on DH, comprising over 300 researchers in 18 countries, thereby opening up opportunities for international collaboration and projects. Of Nordic countries, Denmark is the full partner with four universities, Copenhagen, Aarhus, Aalborg and University of Southern Denmark. Danish DARIAH activities are facilitated by the national DH Infrastructure DIGHUMLAB, hosted at the DARIAH-DK coordinating institution, Aarhus University. Sweden’s first university, Linnaeus University, joined in May 2016 as a collaborative partner. Finland (University of Helsinki) and Norway (Norwegian University of Science and Technology) have taken action to join by the end of 2016 also, as collaborative partners. The idea of forming the Nordic Hub of DARIAH-EU has been recently brought forward by Mike Mertens, the Head of DARIAH-EU. It was met by enthusiasm among the representatives of the listed universities, who would at this panel like to present and discuss possible joint opportunities and challenges in Nordic DH. With its tradition in supporting the Humanities research and development, Nordic countries may serve as a bastion for (Digital) Humanities. The Nordic Hub of DARIAH-EU may pay the way forward towards reaching that aim. Koraljka Golub and Marcelo Milrad will present and analyse the cross-sector and cross-disciplinary Digital Humanities Initiative at Linnaeus University along the axes of its strengths, weaknesses, opportunities and threats. Their long-term vision is to create a leading education in this field and to establish a leading research regional centre that combines in novel ways already existing expertise from different departments and faculties working in close collaboration and co-creation with people and different organizations (both public and private sector) from the surrounding society. Marianne Ping Huang will present the Danish DIGHUMLAB, with specific focus on the DARIAH-related activities with the national DH research infrastructure, which is now bidding for its second period on the DK road map for research infrastructures. The presentation will include a presentation of the Danish participation for DH and open cross sectorial innovation with DARIAH Humanities at Scale (2015-2017) and how this intersects with Aarhus being European Capital of Culture 2017. Mikko Tolonen and Inés Matres will present the ongoing development at the University of Helsinki (and in Finland) regarding digital humanities. This includes the recently launched Heldig (digital humanities centre https://www.helsinki.fi/en/researchgroups/helsinki-digital-humanities) and how it can relate to collaboration in Dariah. Matres will also discuss a survey about Finnish needs about networking within Dariah that she has been mapping before Växjö conference. Andreas Bergsland will discuss the role of digital humanities (DH) at NTNU, a technology and science university with an explicit mission of public humanities. He will present several ongoing initiatives: the ARTEC interdisciplinary task force, DH projects in linguistics, print and sound cultures, digital storytelling and performance, archives, and pedagogy. Bergsland will conclude by reflecting on the opportunities and challenges of promoting critical, sustainable, ethical, and interdisciplinary DH at NTNU in partnership with academic and nonacademic actors and local and global networks such as DARIAH. Major opportunities in DH in Nordic countries lie in the collaborative democratic tradition that supports re- combining already existing expertise and resources encompassing 1) different universities, 2) various disciplines, and 3) the wider community through input from related public and private sectors. These points serve to unite and consolidate already existing expertise in order to create new constellations for collaboration leading to new knowledge and products (expertise, education, research, public and relevant commercial services). Possibilities to collaborate across Nordic countries can take place at a number of levels, including joint research and innovation, education efforts, expertise and experience exchange, bringing in international views to address more regional challenges. Ensuing important value for the general public could be a (re)-affirmation of the value of humanities in particular, and academic practices in general. Challenges would be discussed in terms of the emerging job market, the low number of students pursuing carriers in humanities at the Master level (e.g., in Sweden), and the fact that DH as a field is still in its infancy, leading to it being quite difficult to get funding and grants to carry out long-term research that sustain our efforts over time. Not the least, epistemological, conceptual and terminological differences in approaches by the different disciplines and sectors may present further challenges and therefore may require additional resources to reach an understanding. Further, while there is a strong collaborative spirit across Nordic countries, there will certainly be administrative issues with cross-university collaboration as the current working structures are based on individual units. Gardiner, E. and Musto, R. G. (2015). The Digital Humanities: A Primer for Students and Scholars. Cambridge: Cambridge University Press. Schreibman, S., Siemens, R., and Unsworth, J. (2016). A New Companion to Digital Humanities. (2nd ed.). Malden, MA; Chichester, West Sussex, UK: Wiley-Blackwell. Svensson, P., and Goldberg, D. T. (Eds.). (2015). Between Humanities and the Digital. Cambridge, Ma. : MIT Press.